This section has been setup as a central repository for Paul Vigay's additional Photodesk resources, such as textures and stamps. All images are the copyright of Paul Vigay, but may be freely used in your own documents or web sites. Please give credit if appropriate. If you would like a specific logo or image drawn for you, please contact me and I may be able to create a graphic for you, if you can't find one here. Click on the relevant image in order to download the actual resource file. All files are contained within a ZIP archive. After download, they should be extracted and copied into the appropriate Photodesk Resources location. 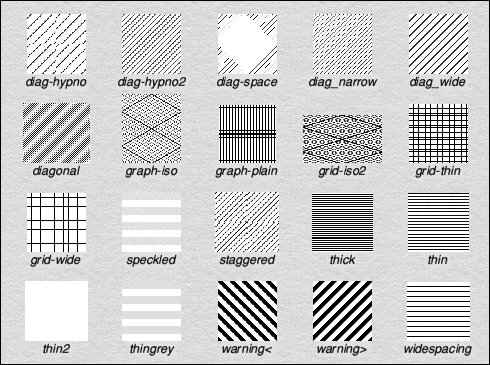 A directory containing 20 'striped' textures, such as graph paper, lines and warning tape designs.